Our coral reefs are all disapperaing too fast.We need to do something about it befoe it's too late. 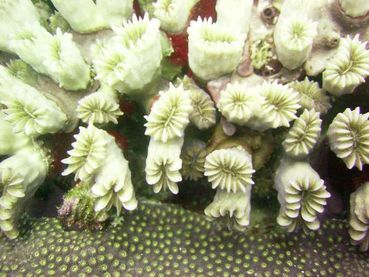 Coral needs a very precise balance of water temperature, depth, turbidity, and pH to survive. Climate change is delivering alteration to nearly every one of these factors. The coral reefs are a vital part of the oceanic food chain. This sounds terrible. The world has to reduce climate changing emissions significantly, and quickly. People must use much less oil and eat much less meat. I wonder what the Koch brothers think about this topic. It is always sad to read such stories but thank you for posting, it is important to know what is happening, even if it isn't good news. Noted with so much Sorrow!